Pay for items using PayPal and have the funds drawn from your prepaid card. Paying with PayPal can be more secure and flexible than paying with your card directly. Also, some merchants don’t accept prepaid cards for payment. Move funds between PayPal and your prepaid card. You can load your card with funds sitting in your PayPal account, or you can pull funds off your card into your PayPal account. Move funds between your checking account and your prepaid card. If you also link your checking account to PayPal, you can use PayPal as a connecting hub for money movement between your checking account and your card. This is useful when your bank or credit union does not support free direct transfers between your checking account and your prepaid card. Send and receive payments from friends using your prepaid card as the source or destination of funds. You can designate your card as the source of funds when sending money to a friend. Or, when you receive a payment, you can move the funds from PayPal to your card. Click on Wallet at the top of the page. Click on Link a card or bank. Click on I have a different bank. Enter the routing number and account number associated with your prepaid card. For FamZoo cards, see here. Click on the bank entry corresponding to your card. Enter the two small amounts that PayPal deposited on your card, and click Confirm. With the linkage to your card confirmed, you can perform any of the operations below. You don’t want to enter your prepaid card information on a site. You may have security concerns about the site, or you may just wish to avoid having to update billing info in multiple places in the future when your card expires or is replaced. You need to pay a merchant who doesn’t accept your prepaid card directly but does accept PayPal. As a classic example, my older kids have used this workaround effectively for Uber. If your card is the only payment method listed on the PayPal Wallet page, and you don’t carry a balance in PayPal, your card will be the source of funds when making purchases. If you have multiple payment methods linked, you may want to set your card as your preferred payment method. To do so, click on your card on the Wallet page, and click on Make this preferred when paying online. Link your prepaid card as a bank account if you have not already. Click on Move money out. Specify the amount, select your linked card account as the destination, and complete the transfer. The money should arrive on your card within 1 to 3 business days. Click on Add money online. Select your linked card account as the source of funds, fill in the amount, and complete the transfer. The money should arrive in your PayPal account within 1 to 3 business days. Link your checking account to PayPal using the same steps you used to link your prepaid card above. Just use the routing and account numbers for your checking account instead of your prepaid card. Move money from your checking account into PayPal using the same steps you use to move money from your prepaid card into PayPal. Just pick your checking account as the source of funds instead of your prepaid card. When the funds arrive into PayPal, load them onto your card as described above. This is just the inverse of the previous recipe. Link your checking account to PayPal. Move money from your prepaid card into PayPal using the the steps here. 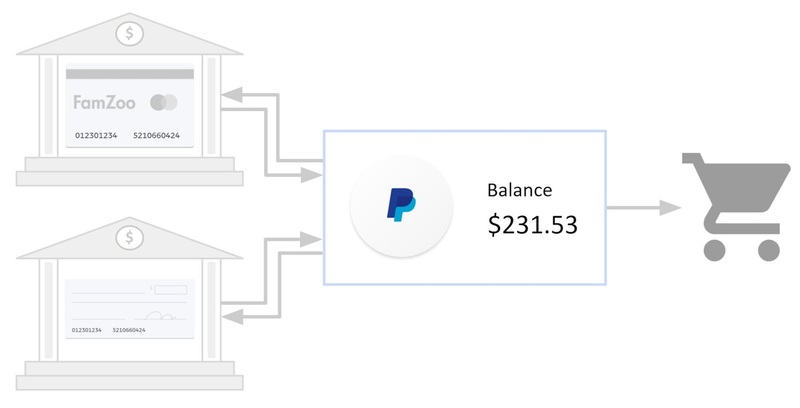 When the funds arrive into PayPal, move money from your PayPal balance into your checking account using the same steps you use to move money from PayPal to your prepaid card. Just pick your checking account as the destination of funds instead of your prepaid card. Enter the recipients email address or mobile number. Select your linked card as the payment source and complete payment. Tell friends to send you money via PayPal using your email address, mobile phone, or PayPal.Me link. When the money arrives in your PayPal account, follow the steps here to move the money from your PayPal balance to your linked prepaid card.